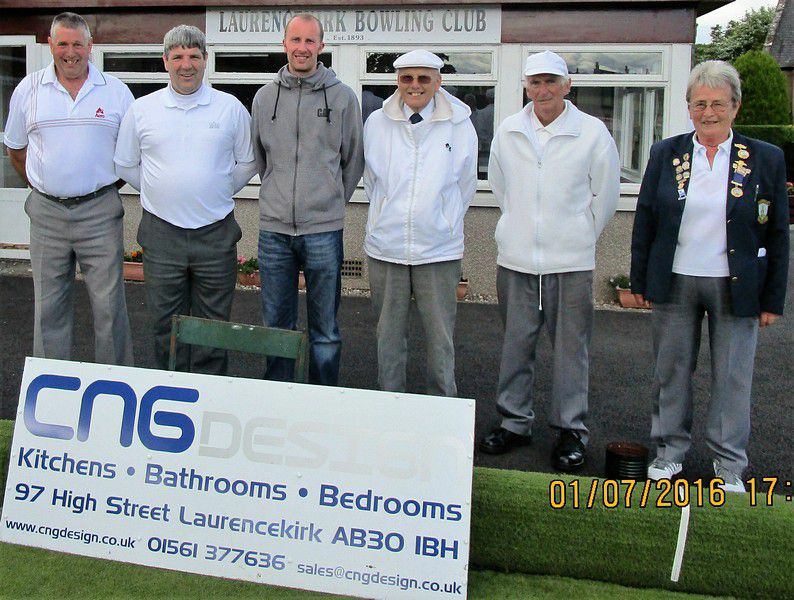 On Sunday 3rd July, twenty four teams from Laurencekirk, Portlethen, Stonehaven, Drumlithie, Culter, Hillside, Johnshaven, Kincardine O’Neil, Kittybrewster and Belhevie took part in the Club’s annual seven end Open Pairs sponsored by local business CNG Design. The threatened rain came to nothing, although the day was quite cold with a blustery wind. After a three game round robin competition and quarter finals, teams from Kincardine O’Neil, Stonehaven and two from Laurencekirk contested the semi finals. Eddie Hay and Kevin Leslie of Kincardine O’Neil got the better of Laurencekirk pair Isobel and Robert Smith by 9 shots to 1, whilst, in the other semi final, David Houston and Duncan Ewing narrowly defeated the second Laurencekirk pair of Norman Reid and Bill Russell by 7 shots to 6. In a hard fought final, the Kincardine O’Neil pairing triumphed over Stonehaven by 6 shots to 3. The winners and runners up are pictured along with Robert Graham of CNG Design, who presented the prizes, and Club President, Margaret McNicoll.